Flip camera is more and more popular today. And this step by step guide will show you how to import your recorded video into Windows Movie Maker or iMovie for further editing, how to upload Flip camera video to YouTube, Facebook ,twitter, how to burn the flip video to DVD to play on DVD player. It’s easy to understand, even you are computer navy can handle with it. If you are using flipshare software to manage your flip video, the video should be save on your MacMovies -> FlipShare Data -> Videos folder, locate the video and import it into iMovie. Make sure that all of the options you want are set before your import the video. After you click import, iMovie will start loading the flip video, it will take a few minutes for iMovie to optimize the video. Once the optimizing has completed, you can preview your flip video on iMovie and start editing it, that’s all. The steps are similar to import video into iMovie. But Flip camera video is mp4 video, and windows movie maker supports wmv video. In order to import flip video into windows movie maker, you need to convert you’re the flip video to wmv video at first. And here is a step by step guide will show you how to convert flip video to wmv video. After you finish the video conversion, run Windows Movie Maker, create a new project. And then click import, navigate WMM to the flip video you saved. WMM will automatically load the video, that’s all. After you recorded some funny video with your flip camera, you may want to share it with friends through YouTube, Facebook, Twitter. Please follow these steps. Connect your flip camera to computer at first, run FlipShare software. If you don’t have flipshare, you can download it from here. Select the video you want to share. Flipshare will pop up a Share panel, click the Online button. And then you have several choices to share your flip video, Facebook, Twitter, YouTube and others. We take YouTube as example on this guide. So select YouTube and click Next. And then you need to log in your Youtube account. Decide if you want everyone (the public) to be able to watch your video, or have it Private. Click the Share button when you’re ready. Now, flipshare will post your video to YouTube, You can see the posting process in the bottom left corner of the screen. Once completed, you can click the YouTube link and it will take you to the your YouTube.com videos page. That’s all. Step2. Load your flip camera video into convertxtodvd by clicking “File -> Add video file”. You can add several video clips at one time, ConvertXtoDVD will join and burn the video clips into one movie file. Done! 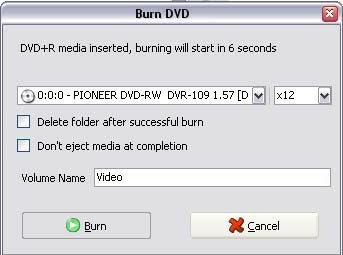 Just so easy to burn your flip camera video to DVD, enjoy it on your home TV.